Look At Me! Listen to Me! Press Me! Contact Me! Me Me Me! Watch Me! Online! Live Performances! Look At Me!Listen to Me! Come See Me! Calendar! Only Child Syndrome with Addie Weyrich Press Me!Contact Me!Me Me Me! 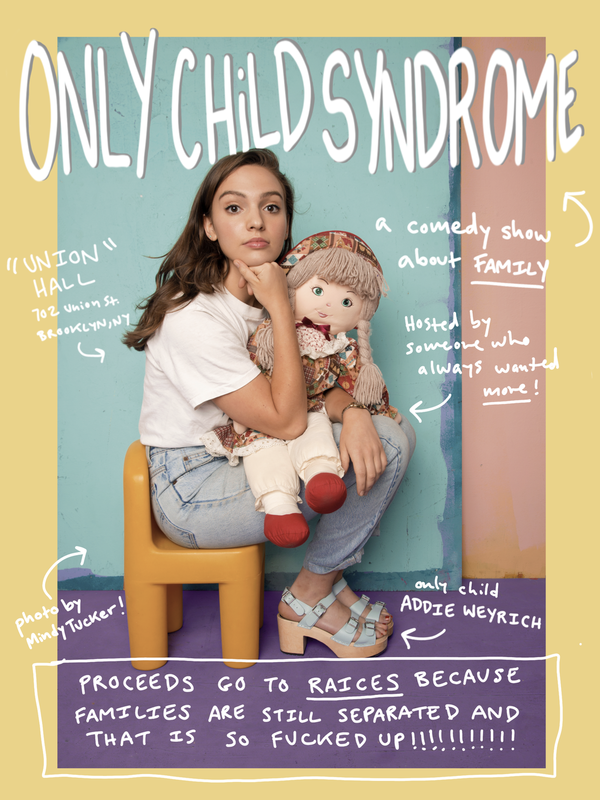 Only Child Syndrome is a comedy show about family hosted by only child, Addie Weyrich. Only Child Syndrome is also the myth that only children are lonely, selfish, spoiled, impatient and maladjusted. What? Ha-ha screw that, but seriously this show is the only show that matters with really funny people who ARE Addie's friends so please come to this show right now this second or else Addie is going to be all alone and we won't be able to raise money for RAICES!!!! So come on!!! Come hear comedians joke about their families, all while giving money to the families that need it.